Growing up in an multi-Asian household, the idea of having deep dark tan has never been an appealing summer look that I wanted to work on. Friends and colleagues tend to chuckle when they find some Asian women wearing those “Darth-Vader-like” visors or holding an umbrella out on a bright sunny day. In most Asian cultures, we really care about our appearances. One aspect for women is to especially be as light-skinned as possible, as my mother taught us that this shows others that you don’t need to work outside like a “farmer-girl” (i.e. ; The tanner one looks, this means the lower they are on the lower-working class scale). It’s funny how in North America, others have different perspectives on seeing those tanned. Around the office, we are curious to learn about those who had their weekend fun outdoors or who just returned from their recent getaways to places like Florida, Hawaii or the Caribbean. During one of these many chit-chats by the coffee machine, I was surprised to learn about the different things we do to protect against the harsh rays of the sun. 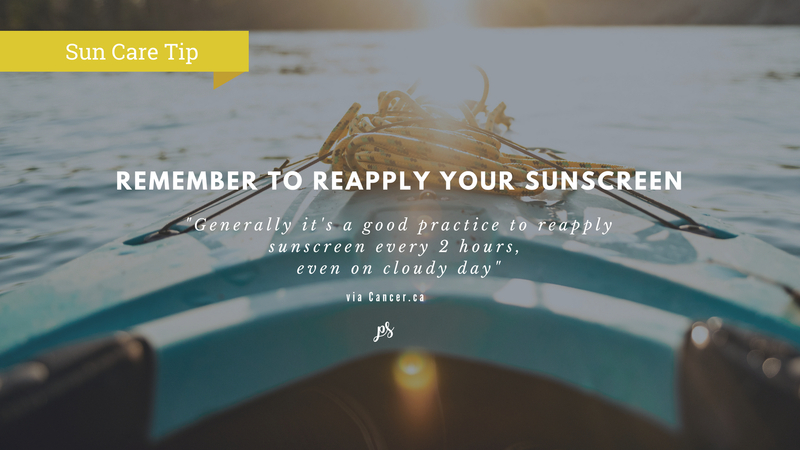 As it’s best to apply your first layer of sunscreen beneath your layers of makeup so the sunscreen can bind to your skin, but what about reapplying more sunscreen? Feel free to right-click to download these images or print this PDF to share on your Health, Safety and Wellness bulletin boards.